I am reading Coach George Allen’s Handbook of Winning Football. Coach George Allen was one of the winningest NFL coaches on the Rams and Redskins in the 60′ and 70’s. I watched his teams many times give my home team Dallas Cowboys fits on Thanksgiving. 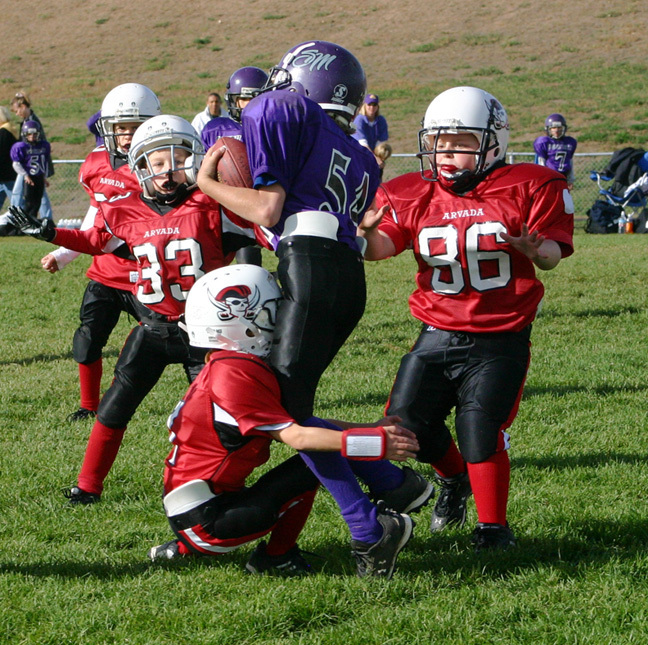 All my life Ive been taught to hit low and form tackle, and that’s what I’ve been teaching. Although a few years ago I wrote a post on the death of form tackling after hearing a few NFL coaches and players talk about tackling. I do think Coach Allen is right, for scatbacks I see young players look low and lose the running back in the process of making a form tackle. The young tackler would have been better off hitting the running back high, grabbing cloth and pulling the RB to the ground. Today we used the Sprint Tackling Drill from AFCA’s Defensive Football Drills book. This is a great open field tackling drill. The ball carrier is about 5 yards behind the bags and the tackler in red is 10 yards behind the middle bag. The defender attacks the middle bag and then must get under control before the middle bag, break down and be in position to make a proper angle tackle on the ball carrier that chooses his hole. This is a great youth football drill. 1. Stop the run, interrupt the pass. 6. Communicate and say again. My defensive team will be called the Wolf Pack this season. Wolves communicate, hunt and kill prey together. As a defense we will play like Wolves attacking their prey.